Despite having many tools and platforms for publishing different types of content, most marketers would prefer to plan and publish from one application. For the past few years, we've been working towards that goal. 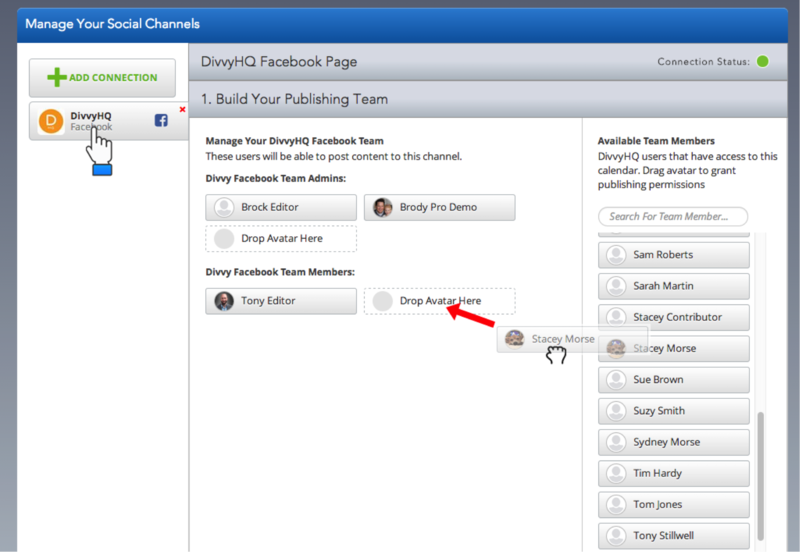 This guide will show you how to connect DivvyHQ to your social networks, give publishing privileges to your team, and start posting social content. In order to manage the myriad of publishing channels that you might want to connect, we’ve built an “Integrations Admin” area, which is your hub for managing your third-party platform integrations. To make your first connection, look for the Integrations Admin under your My Profile menu in the top right. Once there, select the platform category tab that corresponds to the type of platform you wish to connect (currently only Social Channels). Then click the Add Connection button. You’ll then be presented with a pop-up form that directs you to choose one of the available social networks with which we currently integrate. Based on your chosen platform, the system will walk you through an authorization process where you will be required to log in and authorize Divvy’s connection and publishing permissions. For example: If connecting to a Facebook page, you’ll be required to log in with your normal Facebook login credentials, authorize Divvy to publish content on your behalf, and choose to which Facebook page you want to post content. With your channel connection established, click the new connection (tab) to configure your publishing team. Your publishing team should be the users with whom you are comfortable posting content to that channel. Within this Publishing Team tab, there are two area: Team Admins and Team Members. The difference is that Admins can not only publish content to this channel, but they have permission to configure the settings of this channel connection (add other team members, etc.). Team members can only post content. 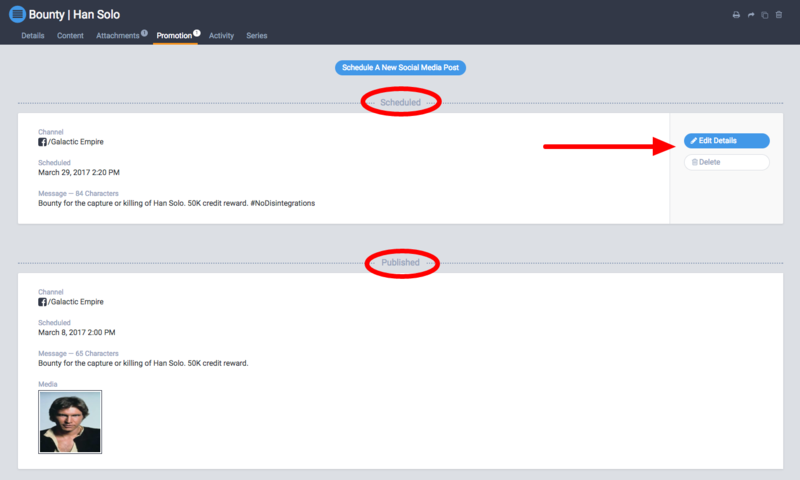 As soon as you have established a publishing channel connection in the Integrations Admin, you’ll now see a Post to Social button within the Details, Content, and Promotion tabs of the Divvy Sandbox. You can click this button in any of those views to bring up the social post overlay. Within the Sandbox > Details Tab the Summary / Description / Social post field also doubles as the Social Post field, which can be the text of your social post. If you plan to post an image along with your social post, open the attachments tab and upload your image. You’ll be able to select this image wherever you hit the Post to Social button. By default, the most recently attached image is auto-selected. Once you’re satisfied with your post text and image (if applicable), hit Save and then click the Post to Social button. This will trigger the Social Post overlay and provide a few final options. 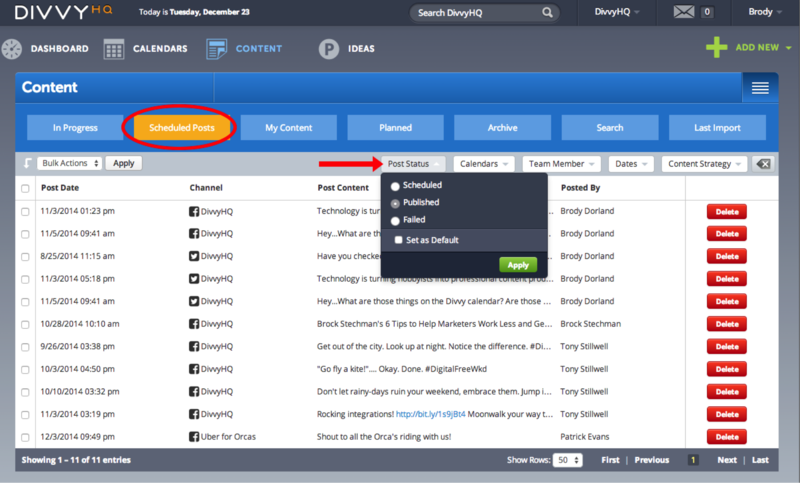 Select channels - You can post to one or multiple channels at the same time. Edit your post text if needed. Preview your social post link associated with your post content. Select the image you want to accompany your post (this will override any social post preview). 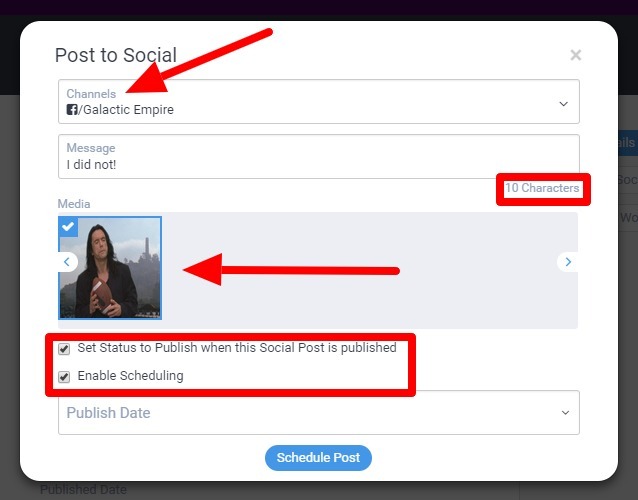 Set the content item status to publish when the first social post associated to the content item goes live. Enable scheduling - Want this to post at a specific date and time in the future? Schedule it! When you’re done, click Post Now. Once you’ve started utilizing DivvyHQ’s direct publishing features, you can view and manage those individual social posts in a couple of different ways. To view your Scheduled/Published post on a per content item basis, click the Promotion tab in the Divvy Sandbox. Scheduled posts will be at the top of this tab, listed in ascending. Published post will listed at the bottom of this tab, listed in descending order. Scheduled posts can be edited or deleted within this view. To view your Scheduled posts, head over to the Content interface and look for the Scheduled Posts tab. In that view, you can use the Post Status filter to toggle between scheduled/future social posts and published posts. You can also cancel scheduled post if necessary.